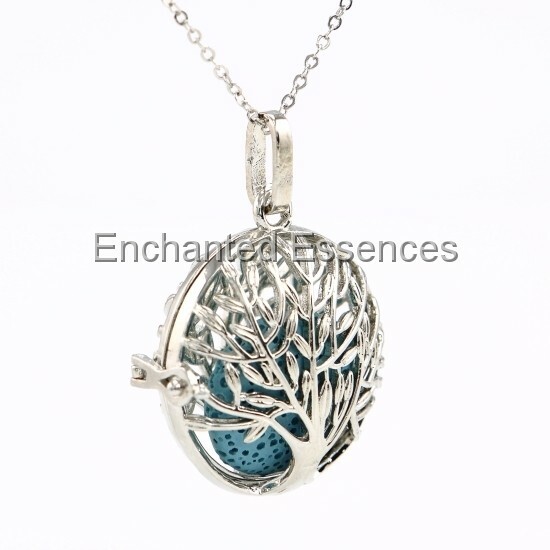 Essential Oil Aromatherapy Pendant. Hand-Crafted Rhodium Plated over Nickle-free and Lead-free Metal Locket. Lava Stone Ball inside. Metal Chain is Included. Essential Oil Aromatherapy Pendant. Hand-Crafted Rhodium Plated over Nickle-free and Lead-free Metal Locket. Lava Stone Ball inside. Lava stones are unique in that naturally-formed voids and irregular surfaces are part of their beauty. The porous material of the rock is what allows the scent to absorb and last. Lava stones are safe with essential oils, It will become glossy and prettier when the oil soaks into it. Lava stones never get corrupted or dissolve in essential oil no matter how much you use it. Just put a drop of essential oil on to the lava stone, allow it to absorb and enjoy the aroma for a few hours or up to a few days, depending on the oil you use. Once the aroma fades away, re-apply the same oil or a different oil on to the lava bead.